Welcome to our latest bulletin with reports on local issues including Wandsworth’s decision to freeze Council tax at current levels, details of the Easter Holiday Fun programme and the latest on the Clapham Junction planning application. Please forward the bulletin to friends and neighbours in the area. Among all the topics, the most important news regarding our action is the date of the Planning Committee to decide on Metro’s proposal to build 2 tower blocks with the redevelopment of the station. We expect the Planning Committee to consider this application at its meeting on Wednesday May 20th. Our renewed thanks to everyone who has let us know their views about this application – it is probably the most important to affect Northcote Ward in a generation. If you have not yet submitted your views to the Council’s Planning department please do so as soon as possible. 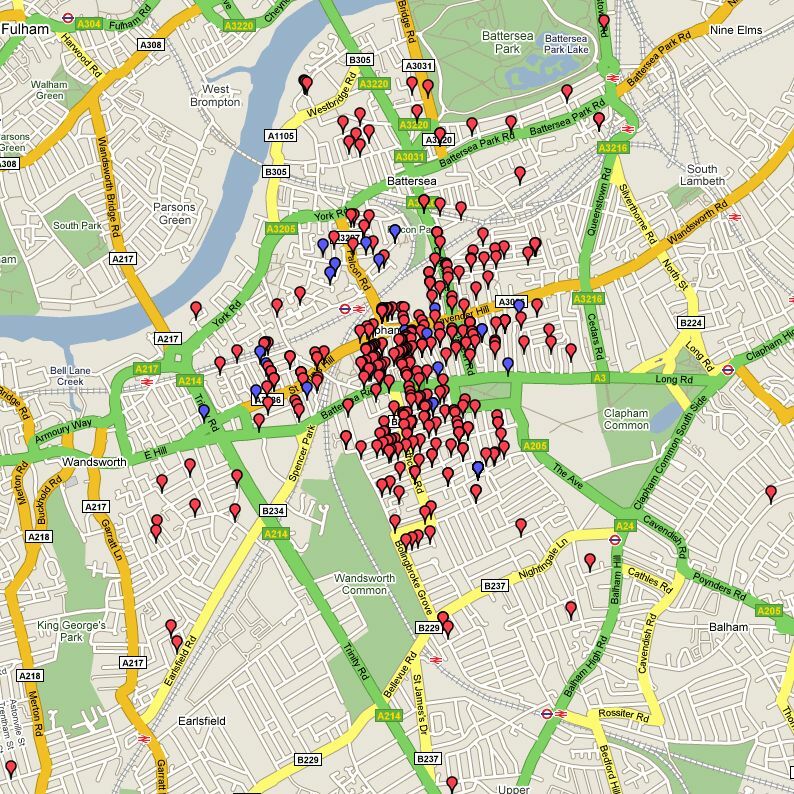 The Clapham Junction action group has analysed the representations made so far and plotted them on a local map. See the article on their website. The website of Metro Shopping Fund, the developer, is: www.theheartofbattersea.co.uk. “The effects of the development would have been felt far wider than just the neighbouring Tooting wards. Northcote would certainly have been affected”. 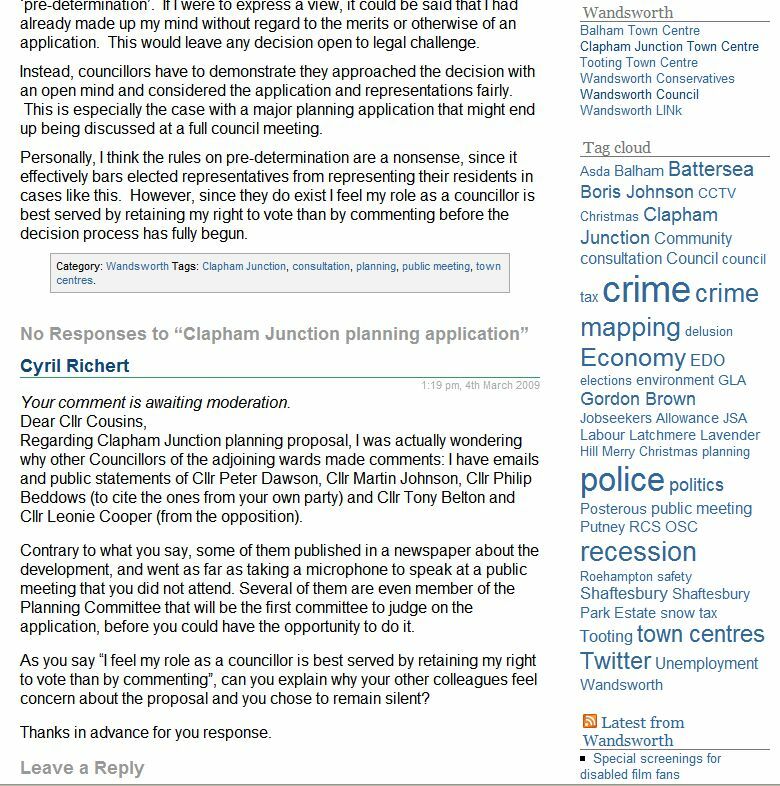 In reference to our previous article “Planning Decision Deferred Again“, South London Press published an article on the Council’s Planning Officer raising concerns about a large number of aspects of the scheme submitted by Metro Shopping Fund (click on the article to see it bigger). Wandsworth 2018: the case for no towers! The council has distributed a brochure in February about its vision for Wandsworth for the next ten years: Our Wandsworth 2018.
supporting active citizenship in the community. First, to be fair, the changes occurring in Clapham Junction Station to improve passenger facilities and accessibility are part of the Government’s £370 million Access for All scheme, which envisaged the station being step-free by the end of 2009. This programme is entirely funded by the government and contractors are installing 9 lifts at Clapham Junction station. The Brighton Yard entrance at the top of St John’s Hill will be re-opened with a ticket office to provide direct access to the overbridge and the lifts. “This is Battersea, not New York. We are failry homogenous community of low-rise, mostly brick-built and frequently Victorian or Edwardian buildings. 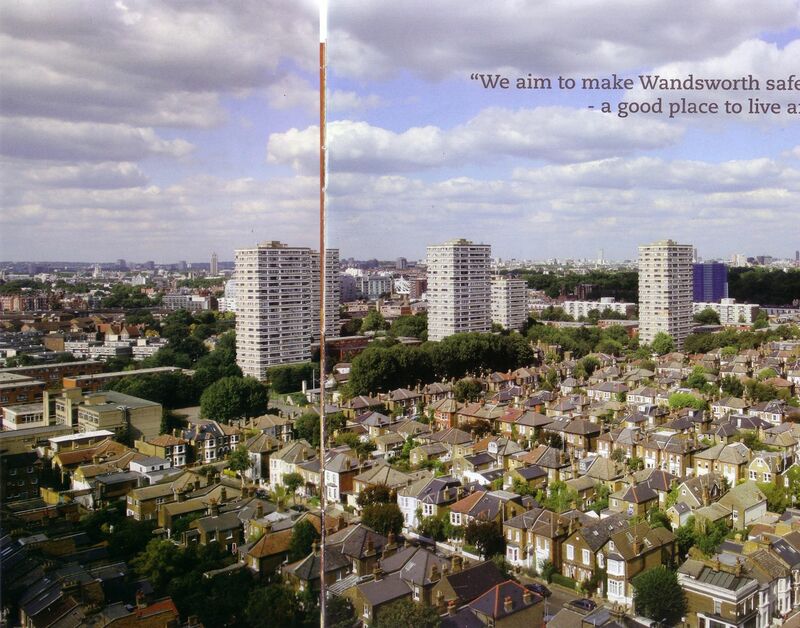 The photo spread accross the opening page of the council’s “Our Wandsworth” brochure amply demonstrates how out of scales and unsympathetic in character are the few existing high-rise blocks in the area. Standing out like a sor thumb is putting it mildly. Places like the sad, greying concrete towers of the Winstanley Estate are a relic of the Sixities craze for high-rise. As a “good place to live” quote par of the slogan you spread accross the aforementionned photo, they have been discredited and many of their fellows have been demolished. Yet Metro wishes to inflict two monstrosities on us, bang in the centre of Battersea, that at 42 stories are roughly twice the height of the tallest Winstanley tower. They are also to be covered in stainless steel blue and yellow cladding which will make them stand out even more – if that’s possible. even in the developers’ own flatteringly constructed mock-ups, these towers look hideous, overpowering and totally out of keeping with their surroundings. Cutting them down a few floors – a favourite developer’s trick – is not an option. At 21 floors they’d still be an eyesore. No towers. Period. […] With the cafés, bars and small shops around Battersea Rise, Northcote Road and St John’s Hill, and Clapham Common nearby we have a village feeling, and you do encounter local friends in the street. It is a comfortable, human-scale place to be – and a Conservation Area. Those alien towers would overshadow everything, with no way to avoid seeing them. The brochure Our Wandsworth 2018 says: “our vision: We want Wandsworth to be a community of global citizens living within environmental limits in an attractive high quality environment”. Do you think that most people will see these monsters as contributing to that “attractive environment”? Up to the 4th of March 2009, we counted 550 objections on the Council’s website. Most of the presentations are detailed, with arguments to express opinions on the plan. On 90% of the letters, you reject the towers, saying they are “two monstrosities“, “hideous, overpowering and totally out of keeping with their surroundings“, “alien“, “obscene“, “out of scales, out of character“, “overwhelming“, “inappropriate“, “eyesore“, “aggressive/confrontational“, “send this proposal to Canary Wharf where it belongs, not nappy valley“, “poor design“, “feel horrified“… etc. This is definitely the number one objection and case for rejection; I don’t understand why it is not the number one preoccupation of the Council for the scheme, especially after their Wandsworth 2018 brochure claiming for a good place to live now and a better place for the future. You should read the letter sent by a local resident on that here. But there are countless of other objections regarding the station development, the transport system, the environment consideration, the congestion created by the new residents. You can find very detailed letters on the Council website, and some of them have been published on our website here and there. Even the Planning Officer is very concerned with the flaws in the proposal, as demonstrated by his letter sent to the developers here. On the other hand, as we were denouncing the level of support recorded by the Council in December, most of them if not all being duplicate letters or sent by the same person (who happens to be working for a PR agency linked to the developers), we are now counting 162 presentations of support. “I would like to express my support for the Metro Shopping Fund’s redevelopment for Clapham Junction Station. You can see an example of those “support cards” on the left hand side (click on the image to enlarge). Therefore I cannot call them “letters of support” as they are just copies of formatted text by a PR agency working for the developers, not even local letters (one is coming from Liverpool!). In addition you probably noticed that they are only support for the station redevelopment, not the two 42 stories tower blocks Metro proposes to build. If you remove those automated-without argumentation-fake support, some of them with not details but just a name, the number of support drops to less than… 50! Amazing, isn’t it? So, 550 objections vs 45 genuine supports (i.e. not formatted by a PR agency). But where is it located exactly? 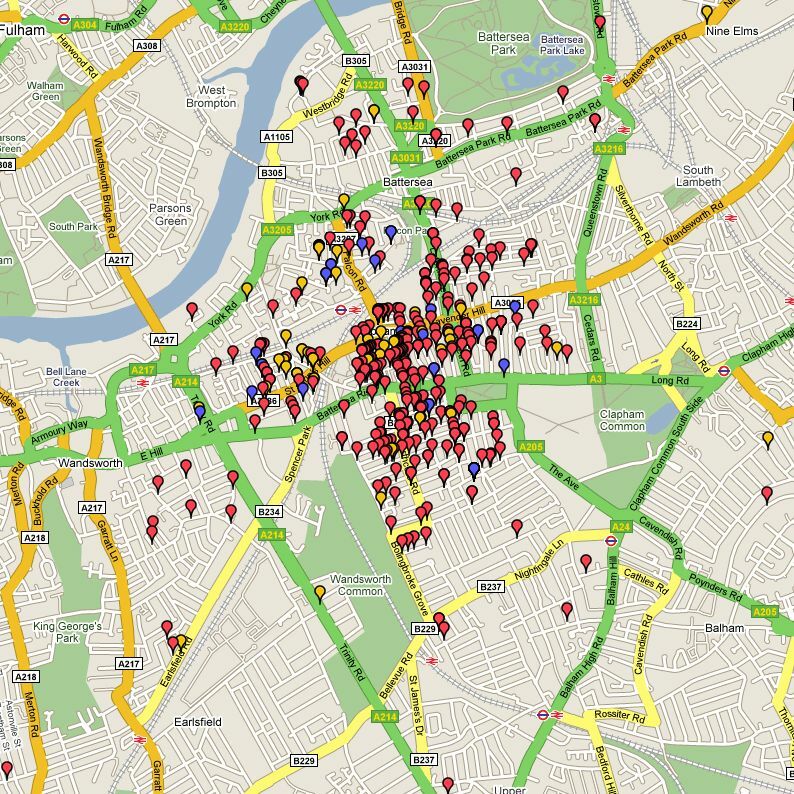 As you can see, there can be NO doubt at all that there is a massive rejection of the developers’ proposal! Network Rail justification: we have not planned any funding before at least 2014, so you MUST accept the proposal! Concerns have been expressed by Mark Hunter, the planning officer, with regard to the role and the transparency of Network Rail in relation to the package of benefits provided. In particular he pointed out that clarity was needed on the funding and the specific benefits that would be provided by the development. Mark Hunter wrote to Network Rail on 23 January to seek clarification. Therefore it seems that Mark Hunter is trying to assess whether these improvements are actually at the expense of other policy considerations such as affordable housing, public realm improvements or sustainability measures. He is rightly pointing out that it is disappointing that Network Rail has not been willing to make any commitment to provide funding for additional work such as platform lengthening. The statement from Network Rail accompanying the planning application says: “Clapham Junction is set to benefit from a separate but related improvement schemes in the coming year”. He is clearly criticizing Network Rail for being aware of big opportunities for them to save money, but refusing to make any clear commitment on their plan and instead sticking to broad statements. Network Rail Strategic Business Plan 2006 included £156 millions for station improvements. How come none of this was allocated to CJ? does the development plan include the Brighton Yard entrance re-opening in 2009, or does it set that aside? are we going to get the explanation and detailed information we need on the Funding and strategy for the East London Line extension? are we going to get details of the package of works proposed and funding – what works? When are the developers going to provide a compelling case for their proposal to close the current subway main entrance? Here comes Network Rail’s answer to the points made by the council’s planning officer. Network Rail was already working on ways of improving CJ station BUT have been told by Wandsworth Council to work with Metro Shopping Fund [i.e. it’s not us, the Council obliged us to work with MSF, but we wanted to spend our own money independently]. They are pleased to hear that the proposed improvements are welcomed [actually they are mistaken because the Planning Officer said: “considerable concern has been expressed”]. In the absence of funding from other sources [does it translate as: in the absence of funding from Wandsworth Council?] Network Rail saw an opportunity of working with Metro [oh, I thought they were forced!]. The footbridge is much more logical than the subway [really? Then most of the travellers using the station must be completely illogical passengers, poor them…]. The proposal has been designed to consider future growth until 2026 [so what do we do then? Build another skyscraper?]. The core of the proposed station improvements is to close the subway at both ends, allowing access to the station only from the footbridge [instead of distributing all this literature about escalators and roof garden, what about asking people what they REALLY think? As has been expressed by the Planning Officer, opinion from a number of quarters is that removing the current entrance/exit will lead to further inconvenience for those interchanging with buses and coming to and from the town centre… let alone creating a longer walk to the platforms]. The new ‘town centre’ will be moved from the current St John’s street (plus Northcote road)/Lavender Hill/Falcon Road/St John’s Hill crossroads with the iconic Arding and Hobbs tower, to the Grand Theatre [therefore losing connection with the shops in Northcote Road and Lavender Hill]. Metro will create a dedicated drop-off taxi facility for the first time at CJ [however the Council has also voted to relocate the taxi-rank from the centre of St. John’s Hill to the kerbside, which will provide a better drop-off facility]. A significant contribution that Network Rail is making is by releasing its land (Brighton buildings, St John’s Hill station entrance, arches in Grant Road [but Brendan, speaking on behalf of the developers said “Network Rail do not have enough land to lengthen and straighten the platforms to current standards, which is why Metro are proposing making land they control available to Network Rail for that purpose”, so it looks rather the opposite…]. Network Rail Plan review in 2008 was asking for £56 million independently of Metro’s proposal [it is not clear here if it was ‘just in case’ or if they intended to spend that amount in addition to the £39.5m of MSF] but [such a shame] it was refused and ‘only’ £20-£25m granted [with such a pittance, surely nothing can be done!]. In addition to the funding detailed above, two other commitments have been made at CJ station. The National Stations Improvement Programme has allocated £2m (funding stair access, information panels, subway improvements, waiting facilities). The Brighton Yard entrance in 2009 will be designed to accommodate no more than 30% of the passengers who use the existing St John’s Hill entrance [great, then it means up to 30% of passengers redirected to Brighton Yard entrance = 30% less congestion than currently! Hip hip hip…]. Basically, according to Network Rail, as the Council did not show them any sign of wrongdoing [and even ‘encouraged’ them to work with Metro Shopping Fund on their proposal], the only recent improvements included in the Network Rail Plan (CP4) are in line with the proposal and of course [as apparently Network Rail could not imagine otherwise] nothing is planned to be funded independently before…2014! Network Rail to look at their contingency plan and make amendments [yes, they can]. MSF to start back from scratch, forget about their hideous towers and redesign a complete new proposal, incorporating the views and objections of the people who live there. MSF proposal is quoted £39.5m + the 2 skyscrapers mandatory, to compare with about £40m (minimum) for a proposal that does not have the ugly tower blocks. What is your choice for the future of your neighbourhood? Go and vote, write to the Council and let them know your views! “It does concern me that many of your points raised are at odds with the atmosphere of the businesslike and constructive discussions I have had with your Council’s officers and I understand have been experienced by our colleagues in the development team“. “In the event that your comments have been the result of scheme objections, then please let Network Rail and metro work with you to help, inform and explain our position“. Can I remind everybody that Network Rail refused to participate in the Public Meeting, claiming that they were busy answering to the Council’s request? Who are they making fool of?